My 7-year-old daughter Mika needed to measure 3 tablespoons of liquid for her science experiment. She asked Jacob for help. He returned with 3 table spoons. During a service at the synagogue. Everyone is singing along with the rabbi. Line muffin pan with cupcake liners and preheat oven to 325 F.
Mix the soy milk and apple cider vinegar in a large bowl; allow to sit for a few minutes to curdle. Beat in agave, oil, vanilla, and almond extract. Sift in the flour, baking powder, baking soda, and salt and mix until smooth. Fill the liners two-thirds full. 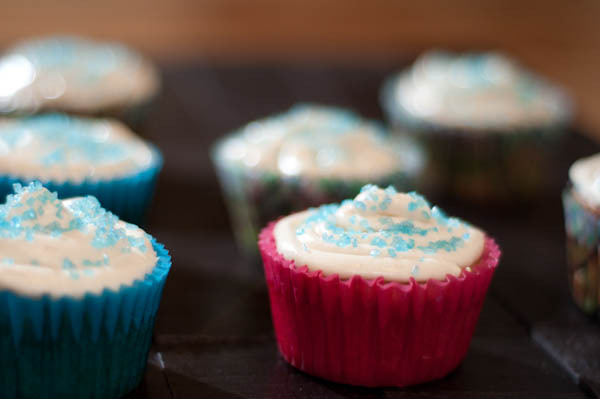 Bake 20-22 minutes until a toothpick inserted into the center of a cupcake comes out clean. 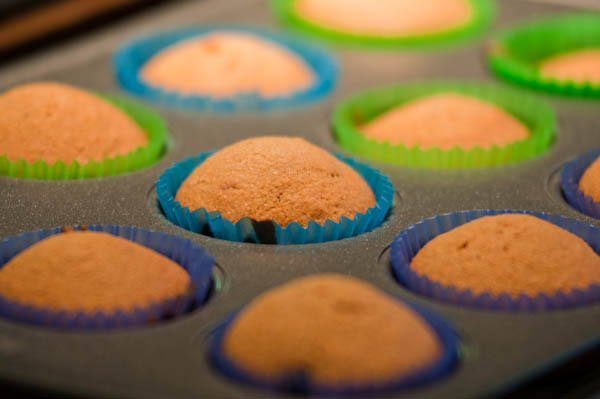 Remove cupcakes from the oven and let them cool in the pan for 5 to 10 minutes. Then transfer them to a cooling rack to prevent sogginess. Cool for at least an hour before topping or filling. Smear liberally with Chocolate Ganache or Cream Cheese Frosting. This makes a lot of frosting – a whole 3 1/4 cups. 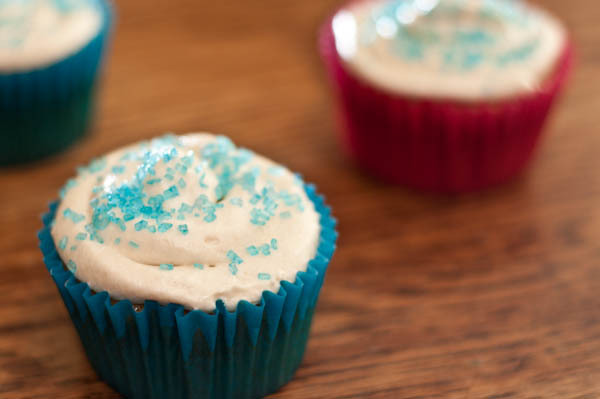 If you are planning to mount frosting heavily onto cupcakes, go ahead and make a whole batch. Otherwise, I suggest only making half. Combine the cream cheese and the butter in a medium bowl. Beat with electric mixer until light and fluffy, about 3 minutes. Gradually add the confectioner’s sugar and 2 tablespoons of the milk and beat until smooth. Add the vanilla extract, and the remaining 1 tablespoon milk if the mixture is too thick. Bring the soy milk to a gentle boil in a small sauce pan. Immediately remove from heat and add the chocolate and maple syrup. Use a rubber heatproof spatula to mix the chocolate until it is fully melted and smooth. Set aside at room temperature. You wish! 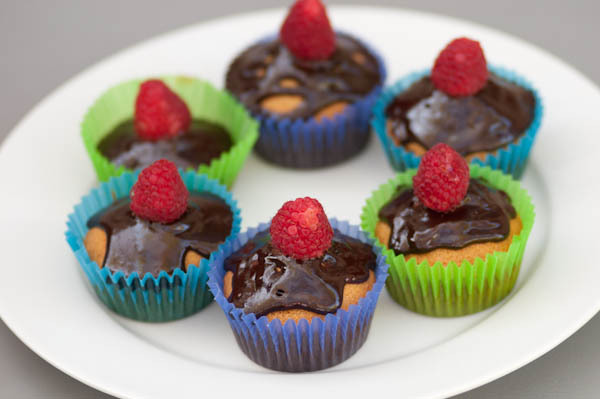 But these cupcakes do go really well with hot chocolate or steamed milk! 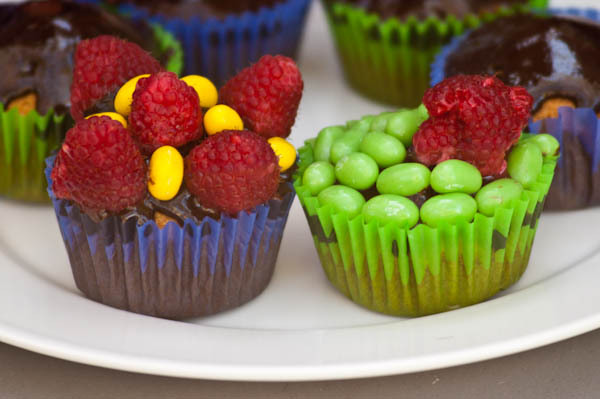 They look very appetizing, cupcakes are one of my favorite desserts, sometimes I just get cupcake cravings and then right away I have to go to a store to buy them. It’s actually a great and useful piece of information. I am happy that you shared this helpful information with us.